Which was the costliest volcanic eruption in history? With the recent eruption of Indonesia's Mount Sinabung comes a reminder that volcanoes still present a deadly risk in many parts of the world. Several people died as villages were burned, farmland destroyed and ash clouds threatened to cause damage to surrounding areas. While naturally the primary concern is saving lives, the economic damage this geological activity causes is thought to amount to billions of dollars a year. Is it possible to determine the economic cost? Direct costs include damage to infrastructure and homes, while indirect costs can include disruption to industry and transport. The International Disaster Database lists the most expensive volcanic eruption as Nevado Del Ruiz in Colombia, which killed around 20,000 people when a mudslide hit the nearby town of Armero. The economic impact of the eruption is estimated at 1 billion dollars. The 1980 Mount St Helens eruption in Washington State in America cost $860 million. The column of smoke and gas reached 15 miles into the atmosphere, depositing ash across a dozen states. 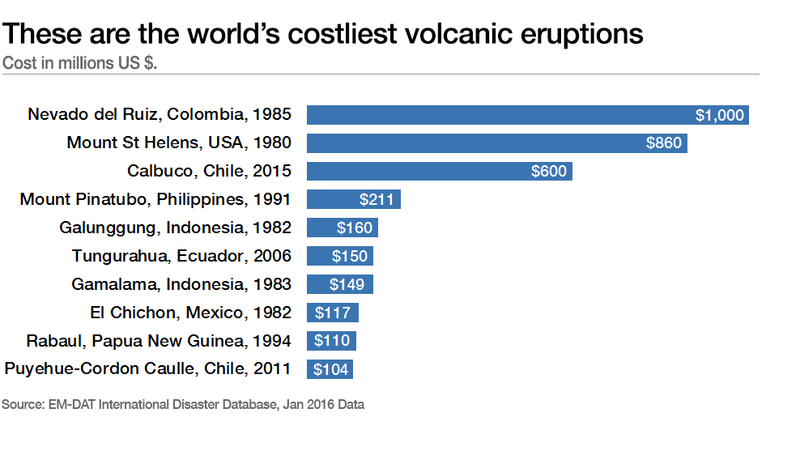 The most expensive eruption in recent years, Calbuco in Chile, is third on the list, at $600 million. Thousands of homes had to be evacuated and the agricultural and tourism industries in Chile suffered severe damage. inevitably, placing an exact cost on such large events is difficult and some estimates vary. Allianz estimates the most expensive volcanic eruption to be the Sidoarjo Mud Volcano in Indonesia; it was triggered during a gas drilling operation. Toxic volcanic mud has now been coming out of the ground for 10 years, and Allianz puts the total cost so far at $3 billion. Although seismologists do not believe volcanic activity is increasing, inevitably the costs of such events grow as countries become more developed and their populations increase. The most devastating incident, in terms of loss of human life, is believed to be the eruption of Tambora in Indonesia in 1815. While it's difficult to quantify the economic cost of historical disasters in the same way as those in the modern era, 92,000 people are thought to have starved to death in the months following the eruption, due to destroyed food supplies and farmland. How do volcanoes compare with other natural disasters? 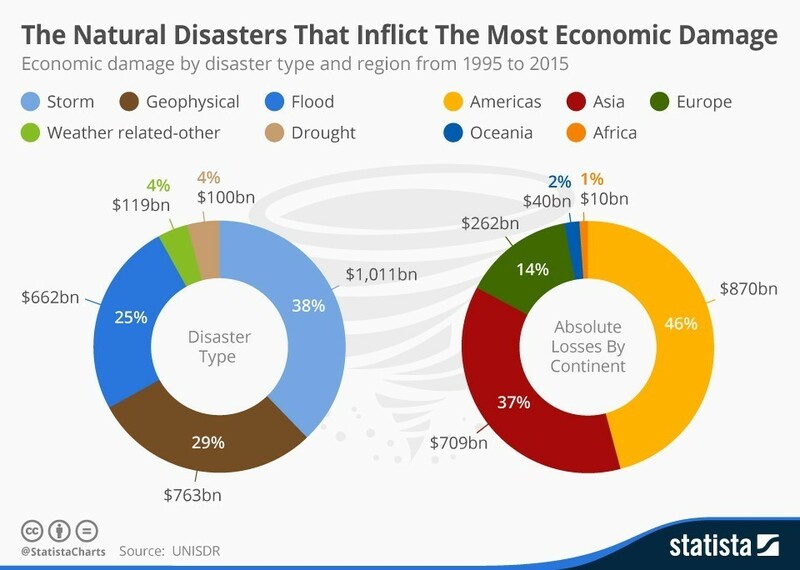 The United Nations has assessed the economic damage caused by all types of natural disasters between 1995 and 2015. It found that geophysical disasters (volcanoes and earthquakes) cost $763 billion. Of these, 20% were volcanic, which puts the cost of volcanic activity at $152.6 billion over 20 years (or an average of $7.6 billion a year). How much do natural disasters cost the world? Is the world prepared for future disasters?